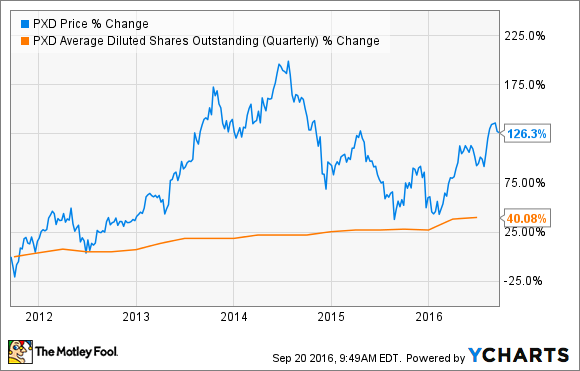 Why Did Encana Corp Sell $1 Billion in Stock? The Canadian oil and gas producer has big plans for its cash infusion. On Monday, Encana (NYSE:ECA) announced that it agreed to sell 107 million shares of stock at $9.35 a share providing it with just over $1 billion in gross proceeds. That is an enormous cash infusion considering that the company's current enterprise value is just over $13.7 billion. However, with its stock price up 82% since the start of the year the company decided to cash in so that it has the financial resources it needs to accelerate growth next year. In doing so, it joined a growing list of producers using their stock as currency to fund growth. Encana plans to use half of its cash infusion to fund a portion of its 2017 capex budget with it expecting to invest a majority of that money in the Permian Basin. That capital will allow it to add enough rigs to bring 120 to 140 horizontal wells online next year, which is twice as many as it brought online this year. That should drive robust oil production growth given the liquids-rich nature of its acreage in the region. Meanwhile, Encana earmarked the other $500 million for balance sheet flexibility and will initially use the funds to pay down borrowings under its credit facility. Doing so will continue the company's remarkable progress on strengthening its balance sheet. As of the end of the second quarter the company cut its debt by roughly $2 billion since the end of 2014. However, in the third quarter the company completed $1.1 billion in asset sales, putting all but $200 million of that cash toward strengthening its financial position. As a result of its progress, Encana's balance sheet is shifting from a liability to an asset. Instead, these frequent equity issuances have allowed the company to fund meaningful production growth while maintaining an excellent balance sheet. That model is in direct contrast to what producers like Chesapeake Energy (NYSE:CHK) and Encana did when oil and gas prices were high, which was to issue debt to fund new wells. That debt came back to burn the sector when prices collapsed forcing heavily indebted Chesapeake Energy and Encana to sell assets to get their leverage under control. Because of the issues so many in the sector had with debt, a growing number of producers are now following in Pioneer's footsteps and using equity to fund growth. In the last month, for example, Permian Basin producers Concho Resources (NYSE:CXO) and Parsley Energy (NYSE:PE) were among several that issued stock to fund acquisitions, capex expansions, and debt repayment. In Concho Resources' case, it sold more than $1.2 billion in stock to pay for a major acreage acquisition, fund part a debt redemption, and cover future capex expenses. Meanwhile, Parsley Energy announced three equity offerings already this year raising $390.6 million, $203 million, and $243.2 million. Parsley Energy, like Concho Resources, used that cash to fund acreage acquisitions and a portion of its capex budget. By using their stock as currency, both companies have maintained relatively low leverage, which enabled them to focus on growing during the downturn instead of repairing their balance sheets. Like many drillers, Encana ran up a tremendous amount of debt to fund growth in prior years. However, that left it hamstrung when prices collapsed forcing it to sell assets to stay afloat. Now we see the company shifting toward a new funding model of using equity to accelerate its growth rate, which appears to be a new way forward for growth-focused producers.